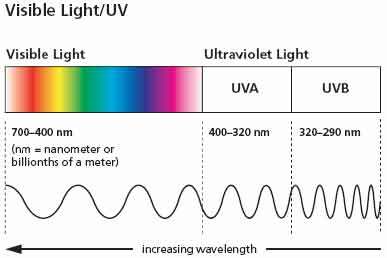 The sun's UVA rays and UVB rays, being the two Ultra Violet rays that reach us here on earth, are both potentially harmful to us humans and we need protection from them both. 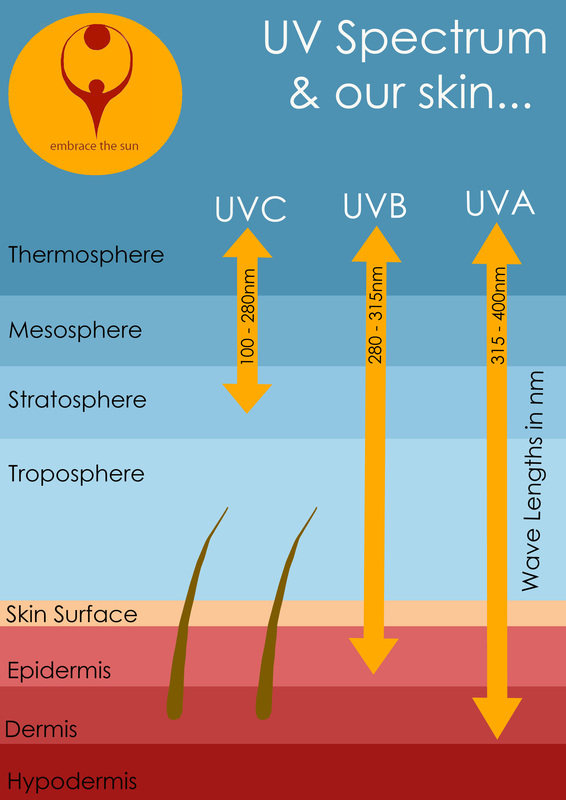 The UVB rays are short wave lengths of light and tend to do most of their damage in the outer layers of the skin, or epidermis. The UVA rays, as the longer wave lengths of light, produce their damage in the inner layers, or dermis, which contains collagen and structural elements of the skin. Knowing the difference between UVA and UVB rays can help you pick out the best sunscreen for you and give you insight into just what each ray is responsible for. Most of us are exposed to large amounts of UVA throughout our lifetime as the UVA rays account for up to 95 percent of the UV radiation reaching the Earth's surface. Although they are less intense than UVB, UVA rays are 30 to 50 times more prevalent. They are present with relatively equal intensity during all daylight hours throughout all the year's seasons, and can penetrate clouds and glass. UVA is the dominant tanning ray, and we now know that tanning, whether outdoors or in a salon, causes cumulative damage over time. A tan actually results from injury to the skin's DNA. The skin darkens in an imperfect attempt to prevent further DNA damage. These imperfections, or mutations, can lead to skin cancer. Since the advent of modern sunscreens around the 1980's, a sunscreen's efficacy has been measured by its sun protection factor, or SPF. This measures the protection provided by sunscreens from the UVB rays only and does not provide us with any idea of how much protection is being provided from the UVA rays. Due to both the lack of consumer awareness of the dangers of UVA rays plus the lack of a globally agreed testing standard for UVA protection, many sunscreens only provided protection against UVB rays, ignoring the importance of effectively blocking powerful UVA rays. Although the ultraviolet A rays do not burn, but rather tan your skin, they do a deeper level damage to your skin. Lack of a universal protocol for UVA testing has proven problematic for manufacturers and confusing for consumers. Since early 2000, many legislative organisations were requesting that all sunscreens must contain broad-spectrum protection. More specifically to provide protection against both UVA and UVB radiation in a ratio of at least 0.4/1 respectively. The new FDA ruling of 2012 requires that all sunscreens must have 'broad spectrum' protection, which means they must provide protection from both UVA rays and UVB rays. Almost every sunscreen meets these new rules for "broad spectrum protection." However, the FDA's criteria is the weakest across the globe. According to the EWG's research (Environmental Working Group), half of the U.S. sunscreens that meet these FDA rules would not make it to store shelves in Europe with their stricter European Union standards (European Commission 2006). The UK and Ireland have used the Boots Star Rating System measurement for decades, which measures a one to five star rating, from low to high protection respectively. 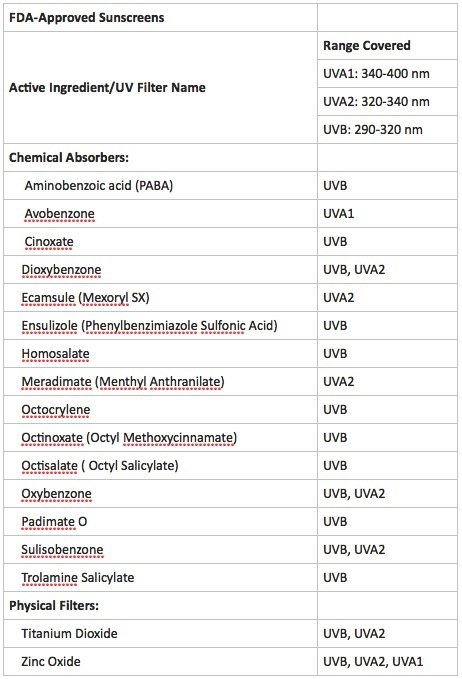 Products are assigned a star rating based on the mean absorbance ratio, which is the ratio of the mean absorbance in the UVA to the mean absorbance in the UVB. Boots revised this system in 2008, and as part of this revision, the 1- and 2-star categories were declared obsolete, as products in these categories would not provide enough protection from the UVA rays. Why choose high levels of protection from UVA rays? Getting a sunburn is a natural system to tell you to get out of the sun. Wearing a sunscreen with high SPF effectively delays this message reaching your brain. It is relatively easy to obtain a sunscreen with high levels of UVB protection. i.e. with an SPF greater than 40. However, it is not easy to obtain a high level of UVA protection ie. UVA 4 star or 5 star. So, if your UVA and UVB protection is not balanced, an extended time in the sun will cause greater amounts of UVA to penetrate undeterred. 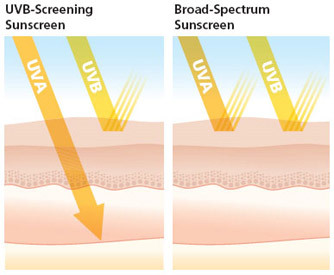 You may see the phrases 'multi spectrum', 'broad spectrum' or 'UVA/UVB protection' on sunscreen labels, and these all indicate that some UVA protection is provided. However, because there is no consensus on how much protection these terms indicate, such phrases may not be entirely meaningful. Our understanding of exactly what kinds of damage UVA rays vs UVB rays causes to the skin, and how best to protect ourselves, seems to shift every year as new research comes out. As new, improved forms of protection against UVA rays keep emerging, it is a worthwhile challenge keeping up with any new developments that can help us prevent sun damage.